We all want to do better to help our environment. Most of us know about small changes we can make, such as driving less or recycling more, to reduce the threat of climate change. But what if you want to do more? What if you could use your investment dollars to help fight climate change's impact on the world? Motif's Climate Change Index Fund is comprised of 25 stocks that include companies in clean energy, energy management, agriculture, clean water distribution, carbon emissions reduction, and waste management. Over the past year, the fund has had a return rate of 31.5 percent. In addition to the Climate Change investment option, Motif also has investment options that focus on fair labor practices and ethical corporate behavior. Etho Climate Leadership is the first index of its kind to be fully divested from fossil fuels. It selects the most carbon efficient companies across a wide variety of industries. In addition to eliminating fossil fuels, it has also eliminated investments from tobacco, weapons, and gambling. The index undergoes a rigorous screening process of its investments that is based on ESG (environment, social, and governance) performance data and incorporates expertise from global NGO (nongovernmental organization) partners. Fidelity created the U.S. Sustainability Index Fund to give its investors access to domestic companies that have strong sustainability profiles. Currently, the fund's top holdings include Microsoft, Johnson & Johnson, and Alphabet (Google). This fund has low expenses and a medium risk rating. Because it's new this year, this fund doesn't have deep historical performance data. However, it has provided an 11.70 percent lifetime return since its inception in May 2017. Vanguard offers a host of socially responsible investment funds. Over the past decade, its FTSE Social Index Fund has seen peaks and troughs in its performance — though this year it has provided the best return in its history at 20.41 percent. 14,248,648 pounds of burned coal. 1,502,503 gallons of gasoline consumed. 12,640 acres of U.S. forests. 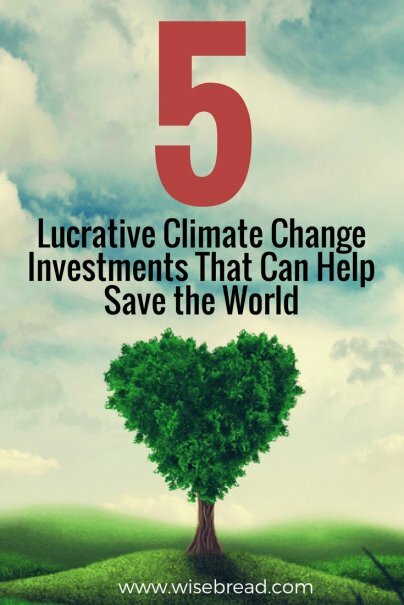 These are just a handful of ways that you can use your investment dollars to provide you with a financial return while helping to fight climate change at the same time. As always, before investing it's wise to consult an investment professional so that you understand the risk/reward ratios of different options and to receive comprehensive advice on all of the investment options available to you.